The £40m distillery at Roseisle can produce 10m litres a year which go into brands such as Johnnie Walker, J&B and Bells. As visitors to Scotland‘s whisky trail wend their way amid the rugged beauty of the Highlands, they are more used to glimpsing the turrets of baronial mansions than outcrops of sleek modernism. But Roseisle, in Speyside, the country’s first major new distillery in a generation, looks like it has been plucked from London’s south bank. A squat industrial design incorporates glass walls that expose the giant copper stills at the heart of the £40m complex, owned by drinks group Diageo. 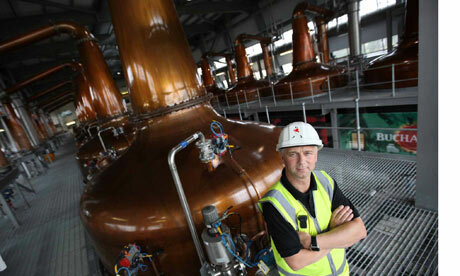 The new distillery is a symbol of optimism for the industry after the uncertainty of the global economic downturn. The scotch industry had been riding high when the financial crisis hit and the subsequent collapse in demand in 2009 ricocheted through important markets like South Korea, where sales contracted by almost 25%. Sales in Spain and Singapore were down 5% and 9% respectively. There was also evidence of drinkers trading down to cheaper spirits – such as hard-up Russians returning to vodka. Boozenews Editor: See a picture of the distillery here.